Wealthy investors do business with numerous banks and form opinions about the banks with which they work as well as the banks which they do not have accounts. Those opinions, related to performance and reputation, are part of Spectrem’s research into investors and their assets. In Spectrem’s research study titled “Asset Allocation, Portfolios and Primary Providers”, Ultra High net Worth investors with a net worth between $5 million and $25 million were asked their perceptions of the providers with whom they work. While almost 30 providers were listed for their perusal, some providers scored much higher in certain categories than others. For instance, these Ultra High Net Worth investors were asked which banks they were “familiar with” and Bank of America was noted by 89 percent of the investors. Fidelity was tabbed by 85 percent, Charles Schwab by 83 percent and Merrill Lynch by 82 percent. Twenty banks were selected by at least 50 percent of the UHNW investors. (The Spectrem study segments the investors by age, wealth, advisor dependency and occupation as well). With the continuing use of social media as a communication device between investors and their providers, the UHNW investors were asked which bank had the most visible social media presence, and Charles Schwab got the top nod at 68 percent of investors. Fidelity and Bank of America were second and third in social media presence. While most UHNW investors have set relationships with banks and financial providers, there are some investors who plan to start or increase their relationship with banks, and 45 percent of UHNW investors said they were likely to start or increase their usage of Vanguard in the future. Thirty-six percent said they were going to increase usage of Vanguard, and 28 percent said Charles Schwab was likely to get new business or more of their business in the near future. Vanguard got the No. 1 spot among companies with expertise in managing money, with 82 percent of UHNW investors rating it for that expertise. 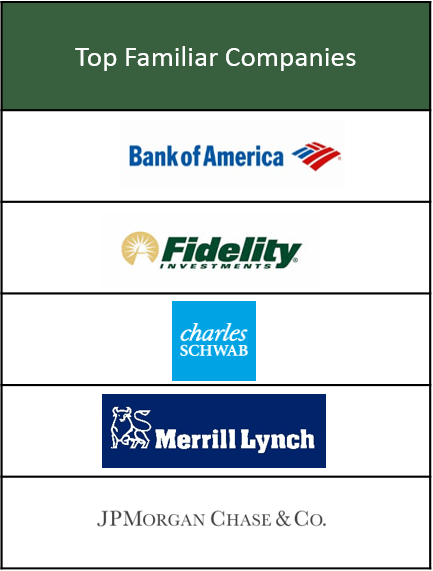 Fidelity and Charles Schwab finished second and third among the 28 banks suggested in the Spectrem study. Sixty-five percent of investors selected Vanguard for having innovative products and services, and Fidelity was the only other bank chosen by at least 60 percent for that quality (64 percent). Vanguard was also No. 1 for having talented advisors, selected by 81 percent of UHNW investors.